Step by step, this powerful movie takes a man from perfect happiness into a personal hell. By the end of the film, the man is behaving irrationally, but here's the frightening thing: Because we've followed him every step of the way, we have to admit he's behaving as we ourselves might, in the same circumstances. The man in “Smash Palace” is Al Shaw, a Grand Prix driver who leaves the racing circuit to take over his father's auto garage in New Zealand. Played by Bruno Lawrence, Al is a straight-talking, direct man who enjoys working with his hands and takes a vast delight in the affections of his wife and the love of his small daughter. It's a long way from the Grand Prix to repairing transmissions, but he's happy with his work and content to raise a family in peace and quiet. His wife (Anna Jemison) is not so content. She wanted him to leave the racing circuit before he was killed, but now, in the quiet backwaters of New Zealand, she is going quietly stir-crazy. She begins an affair with a local cop (Keith Aberdeen) and finally tells her husband she's leaving him. She's moving into town. Her decision starts him on a series of wrong moves that may seem logical, one by one, but which eventually add up in the minds of others to a simple conclusion: He has lost his reason. He is jealous--of course. He holds a great fury against his wife and the cop. But, much more important, he misses his daughter. He wants custody. But because he acts in ways that are violent and frightening to his wife (and because her lover is on the police force, which must respond to the domestic emergencies he creates), he works himself into a Catch-22: The more he does to take back his daughter, the closer he is to losing her. Finally, he kidnaps her. He takes her out into the woods where they live together for a time in isolation and happiness. It's an idyll that can't last. But “Smash Palace” doesn't lead up to the inevitable violent conclusion we might expect. All along the way, this film prefers the unexpected turns of actual human behavior to the predictable plot developments we might have expected, and, at the end, there's another turn, a fascinating one. 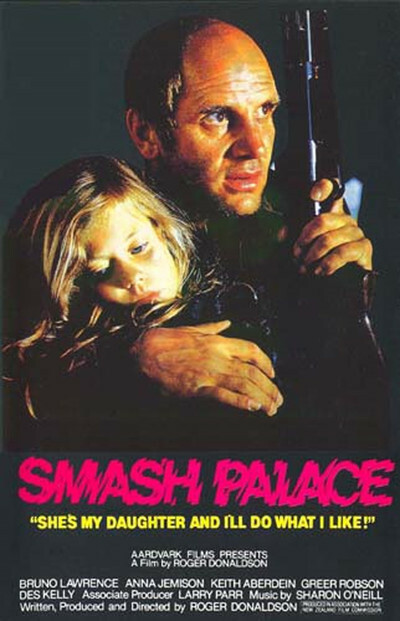 “Smash Palace” is one of 1982's best films, an examination of much the same ground as “Shoot the Moon,” but a better film, because it has the patience to explore the ways in which people can become consumed by anger (“Shoot the Moon” contented itself with the outward symptoms). One of the reasons the movie works so well is the performances, which are all the stronger because they come from actors we have not seen before. Bruno Lawrence, bald-headed, wiry, tough, and surprisingly tender, is just right as the man who loses his family. Anna Jemison has a difficult assignment as his wife: We're on his side, and yet we see the logic of her moves. Keith Aberdeen is properly tentative as the other man; he feels love and lust, and yet is not unaware of the unhappiness he is causing. And there's a guy named Des Kelly who plays Tiny, an employee at the Smash Palace who looks on, and sees all, and wishes he knew what to do. The movie was directed by a young filmmaker named Roger Donaldson, who, in a sense, is the New Zealand film industry. He has produced six features for New Zealand television, and his first feature film, “Sleeping Dogs,” starred Warren Oates in a horrifying and plausible fantasy about the American occupation of New Zealand. Now comes this film, so emotionally wise and observant that we learn from it why people sometimes make the front pages with guns in their hands and try to explain that it's all because of love. Love, yes, but also the terrible frustration of trying to control events, to make people do what you want them to do, what you "know" would make them happy--no matter what they think. The hero of “Smash Palace” does not act wisely, but if we are honest, it's hard to see where we might have acted differently.